The Automatic Electric Type 40 Monophone was introduced in 1938. This combined phone includes all the components required to operate with in the casing, eliminating the need for an external network subset and ringer. It will operate on modern telephone lines. This particular Type 40 has been refinished in Royal Blue. We have used a product called Polane that is very resitant to chipping or cracking. This product has been applied using using the very same materials and procedures implemented by the actual phone manufacturers of yesteryear. The AE40 is a graceful example of art deco design. 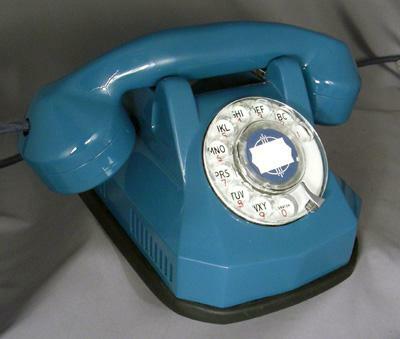 These rugged phones were made of solid bakelite and were available in a variety of colours with various trim options. Although AE never made this particular shade of blue, we think it looks fantastic. My Favorite part about this phone is its Chrome trim. We have added a chrome "pickup" bar to this classic. The custom color dial center finishes the look nicely. The phone has been fully refurbished, and is in excellent working condition. 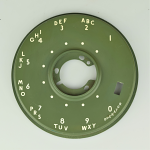 The dial has been lubricated and timed to ensure that it will give years of trouble free service.